Visit Monaco has welcomed the launch of the principality’s new Green is the New Glam campaign as it seeks to become a destination that is as environmentally conscious as it is glamorous. Grifco PR has announced it will be handling the public relations for Visit Monaco, the Monaco Government & Tourist Authority. The UK-based company will be responsible for Visit Monaco’s consumer, trade, MICE and social media communications within the UK and Scandinavia. Former Starwood global account manager, Rebecca Petit-Jean, has been appointed by Monaco Tourist Authority as the new regional sales manager for the UK, Ireland and Scandinavia. British Organic spa and beauty brand ila has announced a partnership with Thirty • Nine Monte Carlo, an exclusive private sports club located on the illustrious 39 Avenue Princesse Grace, in the heart of glamorous Monaco. Thirty • Nine combines the best in fitness, nutrition and wellness to help members live a healthy, happy and balanced lifestyle. Monaco Tourist	Authority has welcomed press, trade partners and friends for an incredible showcase of the best of the destination’s accommodation, attractions and events. Representatives from Fairmont Monte Carlo, Columbus Monte-Carlo, and Monte-Carlo Société des Bains de Mer (Hôtel de Paris Monte-Carlo, Hôtel Hermitage Monte-Carlo, Monte-Carlo Bay Hotel & Resort, and Monte-Carlo Beach) and Kirker Holidays were all on hand at One Horse Guards parade to welcome guests to the event. Monaco has organised its participation at Expo Milan 2015 around the themes of solidarity and sharing, to show how prosperity gained through the centuries can be used as an incentive to promote the values of solidarity, environmental protection and the growth of a green economy. 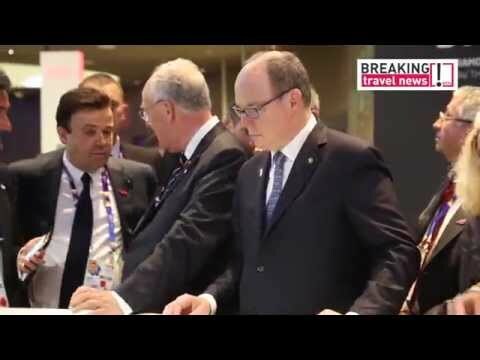 Take a look as Prince Albert II of Monaco visits Expo Milano 2015. Monaco has organised its participation at Expo Milan 2015 around the themes of solidarity and sharing, to show how prosperity gained through the centuries can be used as an incentive to promote the values of solidarity, environmental protection and the growth of a green economy. Take a look as Prince Albert II of Monaco visits the show for the first time. The Monaco Yacht Show is gearing up to again bring together the captains of industry, the savvy owners and the highest-net-worth clientele for four days of intensive meetings and viewings. With 500 of the leading superyacht companies on the stands, the show will this year take place from September 19th-22nd. A new, 600-m² area has just been created on the Museum’s panoramic terrace. A mythical creature, the subject of films, scary, chased, mutilated … the shark is in great danger. It’s a predator that has become prey. More than 30% of shark species are threatened with extinction. Every year, more than 100 million sharks are caught in the oceans.